RICHMOND, Ind.— A former Richmond attorney convicted of stealing from his clients has paid those clients back $31,909, records show. Edward Kemp pleaded guilty to one count of theft and spent 2.5 months behind bars from May 10, 2017, to July 31, 2017. As part of his plea agreement, Kemp agreed to pay the $31,909 to the clients he stole from. The Wayne County Clerk’s Office says the money will be distributed to 11 victims, including Don Rader. Rader contacted Call 6 Investigates Kara Kenney back in 2014 after he said Kemp took his money and mishandled his deceased father’s estate. Rader said he received a restitution check on Monday for the full amount, $18,609. Kemp refused to talk to Call 6 Investigates Kara Kenney on his way into court in 2017, but while on the witness stand last year, he apologized to his victims. Kemp said he got in over his head while doing private practice, and handled his business poorly. “I can’t go back and repair the damage I’ve caused, but I can pay the money back,” said Kemp, who asked the judge for probation. Kemp has been driving a truck and said he does not plan to practice law ever again. His law license is currently listed as “resigned” in Indiana. Former clients credited Call 6 Investigates for exposing Kemp. 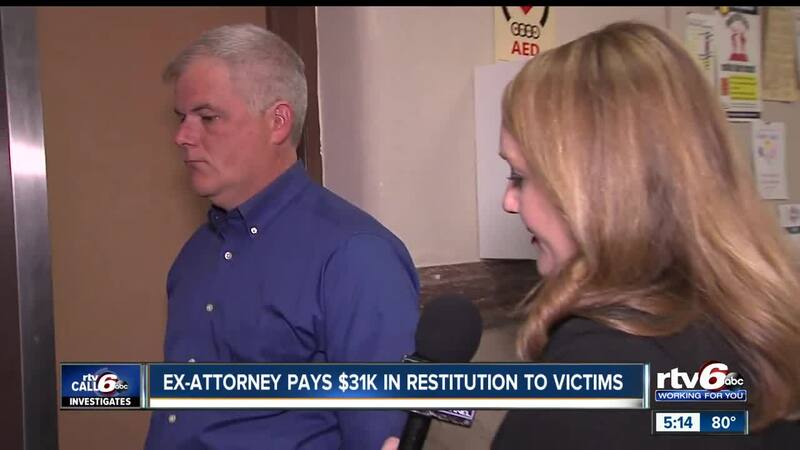 “I appreciate all the help you've been, and if it wasn't for you and Channel 6 I don't think the prosecutor would have ever filed criminal charges,” said Rader. “I'm confident the media attention put pressure on the prosecutor's office to do something about it." Kemp served as a public defender in Wayne County for a year, leaving the office in July 2014.